If you love history, British culture, gorgeous costumes, and high quality soap operas, then Downton Abbey is the show for you. In honor of the series’ new fourth season, I’m paying tribute with a few modern outfit ideas inspired by Downton Abbey’s amazing 1910s fashion. 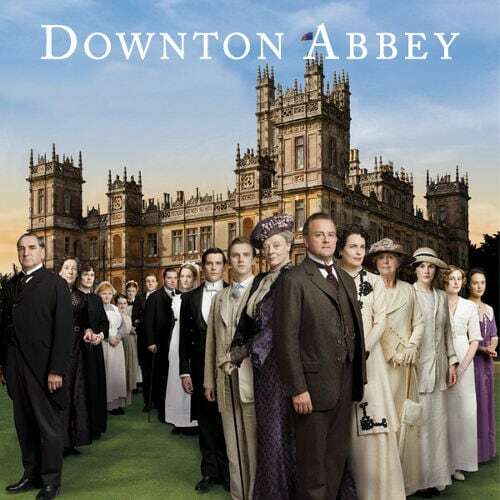 Downton Abbey, created by British writer and actor Julian Fellowes, began its first season in 2010. The show follows the aristocratic Crawley family, consisting of the Earl and Countess of Grantham and their three daughters, along with the large staff of their British country estate. The first season is set in 1912, when the family has just learned that the heir to their estate has died aboard the Titanic – a tragedy which shakes the entire household. Thus, the family reluctantly prepares to meet the new heir, a distant relative and virtual stranger. In addition to the trouble with inheritance, the show goes on to deal with the loves and marriages of the three Crawley daughters, Mary, Edith, and Sybil, the lives of the maids, footmen, and other staff who keep Downton running, and later, the events of World War I. This first outfit is inspired by the hardworking staff of Downton Abbey. To stick with the same black-and-white palette as their uniforms, I’ve started with a belted black skirt and a crisp button-up shirt with lace detailing, which mimics the lace on the maids’ aprons. Keep it conservative with opaque black tights, then slip on some practical yet cute black lace-up ankle boots. Instead of the traditional white headband, go with a slouchy white beret for a modern touch. Lastly, accessorize with classic pearl earrings and a simple black satchel. 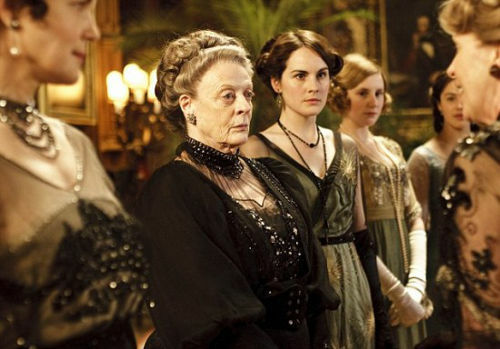 The ladies of Downton Abbey are almost always dressed up – for them, every dinner is a formal occasion. To mimic their style, go for a longer midi dress with sheer layers, an open neckline, and a fitted waistband. Switch out their low black Mary-Jane heels for a higher neutral-colored version, then glitz things up with a beaded belt and jeweled clutch. The Downton ladies never skimp on jewelry, so go all out with a long pearl necklace, drop earrings, and a pretty hair brooch. Finish things off with an elegant updo and a light swipe of lipstick. 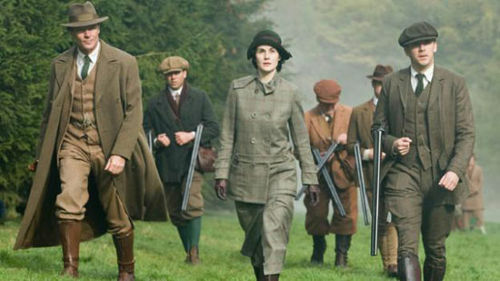 Hunting is a popular pastime for the aristocratic Crawleys, so imitate their outdoorsy ensembles with a plaid blazer and muted green corduroy pants. Layer a cream sweater underneath, then slip on some brown lace-up boots. For a modern touch, style your hair in a messy braid, but don’t forget to hearken back to Downton with a pair of brown leather gloves. Are you a Downton Abbey fan? What do you think of the show’s period fashion? Which look is your favorite? Let us know in the comments!